Married Name Her married name was Englefield. Jane Browne married Francis Englefield. Jane Browne was born in 1575. Jane Browne died in 1650. Name Variation Francis Englefield was also known as Engelfield. Francis Englefield married Jane Browne, daughter of Anthony Browne and Mary Dormer. Francis Englefield was born circa 1562. Married Name Her married name was Lee. Dorothy Browne married Edmund Lee. Dorothy Browne was born in 1575. Dorothy Browne died in 1652. Edmund Lee married Dorothy Browne, daughter of Anthony Browne and Mary Dormer. Edmund Lee was born circa 1573. Married Name Her married name was Temple. Dorothy Lee married John Temple. Dorothy Lee was born in 1590. She was the daughter of Edmund Lee and Dorothy Browne. Dorothy Lee died in 1625. John Temple married Dorothy Lee, daughter of Edmund Lee and Dorothy Browne. John Temple was born circa 1592. Mary Temple married (?) Nelson. Mary Temple was born in 1623. She was the daughter of John Temple and Dorothy Lee. Mary Temple died in 1654. (?) Nelson married Mary Temple, daughter of John Temple and Dorothy Lee. John Nelson was born in 1654. He was the son of (?) Nelson and Mary Temple. John Nelson died in 1734. Married Name Her married name was Lloyd. Rebecca Nelson married (?) Lloyd. Rebecca Nelson was born in 1688. She was the daughter of John Nelson. Rebecca Nelson died in 1728. (?) Lloyd married Rebecca Nelson, daughter of John Nelson. Married Name Her married name was Aspinwall. Margaret Lloyd married (?) Aspinwall. Margaret Lloyd was born in 1713. She was the daughter of (?) Lloyd and Rebecca Nelson. Margaret Lloyd died in 1756. (?) Aspinwall married Margaret Lloyd, daughter of (?) Lloyd and Rebecca Nelson. John Aspinwall was born in 1706. He was the son of (?) Aspinwall and Margaret Lloyd. John Aspinwall died in 1774. Married Name Her married name was Kortright. Hannah Aspinwall married Lawrence Kortright. Hannah Aspinwall was born in 1735. She was the daughter of John Aspinwall. Hannah Aspinwall died in 1777. Lawrence Kortright married Hannah Aspinwall, daughter of John Aspinwall. Married Name 16 February 1786 As of 16 February 1786,her married name was Monroe. Elizabeth Kortright was born on 30 June 1768 at New York. She was the daughter of Lawrence Kortright and Hannah Aspinwall. Elizabeth Kortright married James Monroe on 16 February 1786 at New York. Elizabeth Kortright died on 23 September 1830 at Virginia at age 62. First Lady. Elizabeth Kortright Monroe was the wife of President James Monroe. She spent many of her years as First Lady frail and sickly. James Monroe was born on 28 April 1758 at Virginia. He married Elizabeth Kortright, daughter of Lawrence Kortright and Hannah Aspinwall, on 16 February 1786 at New York. 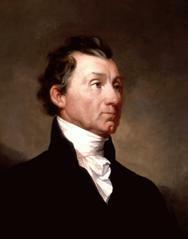 James Monroe died on 4 July 1831 at New York at age 73. James Monroe was the fifth President of the United States (1817–1825). His administration was marked by the acquisition of Florida (1819); the Missouri Compromise (1820), in which Missouri was declared a slave state; the admission of Maine in 1820 as a free state; and the profession of the Monroe Doctrine (1823), declaring U.S. opposition to European interference in the Americas, as well as breaking all ties with France remaining from the War of 1812. Married Name Her married name was Shepard. Agnes Edson married Henry Milton, son of Richard Milton. Agnes Edson married Robert Shepard. Agnes Edson was born in 1504. Robert Shepard married Agnes Edson. Rose Shepard was born in 1549. She was the daughter of Robert Shepard and Agnes Edson. Rose Shepard died in 1625. Elizabeth Jarman married Edward Morgan, son of James Morgan. Elizabeth Jarman was born in 1670. Joseph Morgan was born in 1702. He was the son of Edward Morgan and Elizabeth Jarman. Joseph Morgan died in 1748. John Touchet married Baroness Isabell Audley, daughter of James De Audley and Isabel Le Strange. John Touchet was born on 23 April 1371. He died on 19 December 1408 at age 37. Margaret De Ros was born circa 1361. She was the daughter of Thomas De Ros and Beatrice Stafford. Married Name before 1379 As of before 1379,her married name was de Clifford. Elizabeth De Ros was born circa 1367. Elizabeth De Ros married Thomas de Clifford before 1379. Elizabeth De Ros died in March 1424. Married Name before 16 July 1334 As of before 16 July 1334,her married name was La Zouche. Elizabeth De Ros was born circa 1325. Elizabeth De Ros married William La Zouche before 16 July 1334. Elizabeth De Ros died after 16 May 1380. Name Variation Charlotte Grimstead was also known as Grinstead. Married Name Her married name was Bowes Lyon. Charlotte Grimstead married Thomas George Bowes Lyon, son of Thomas Lyon Bowes and Mary Elizabeth Louisa Rodney Carpenter. Charlotte Grimstead was born in 1797. She was the daughter of Joseph Valentine Grimstead and Charlotte Sarah Jane Walsh. Charlotte Grimstead died in 1881. Thomas Lyon was born in 1741. He was the son of Thomas Lyon and Jean Nicholsen. Thomas Lyon died in 1796. Charles William Cavendish Bentinck married Caroline Louisa Burnaby, daughter of Edwyn Burnaby and Anne Caroline Salisbury. Charles William Cavendish Bentinck was born in 1817. He was the son of William Charles Cavendish Bentinck and Anne Wellesley. Charles William Cavendish Bentinck died in 1865.